This single-zone Husky Reflections HUS-HN10 Wine Cooler provides a beautifully controlled storage space for your precious wine bottles. Ideal for the wine enthusiast You'll be able to store up to 34 standard 75cl wine bottles in this great dedicated drinks fridge, which maintains a temperature range of between 5 and 18 degrees Celsius. Set it to a cooler level for your white wine and rosé (generally between 7 and 10°C), or higher if you're more of a red wine enthusiast (between approximately 10 and 18°C). Beautiful wine storage The Husky Reflections HUS-HN10 Wine Cabinet looks stylish inside and out, adding a subtle contemporary touch to any decoration scheme and even bringing a level of ambience to your dinner parties. Its six wood shelves gently cradle those beloved bottles, and there's a drawer rack in the base of the unit for extra storage. A stainless steel trim door is offset by reflective mirror effect glass and a tasteful integrated handle. With soft interior lighting, your wine collection will look great on display in this premium wine fridge, which keeps it efficiently cooled at all times. Practical controls Use the external LED display to monitor appliance temperatures and settings. The Reflections HUS-HN10 Wine Cooler also features electronic touchscreen controls for effortless adjustment. Compressor technology helps the appliance to stay more energy efficient, and it even features automatic defrosting to spare you mess and hassle, keeping your wine in tip-top condition. Complement your home and preserve your favourite drinks with the Husky Reflections HUS-HN10 Wine Cooler. 41 to 50 dB(A). 34 bottles - 98 litres. Wood shelves x 6 - Drawer rack in base. LED - Temperature - Light. Compressor technology - Auto defrost. This product requires professional installation. Please consult with a qualified installation expert. 100 mm all around the unit including the top and the back. 848 x 495 x 430 mm (H x W x D). 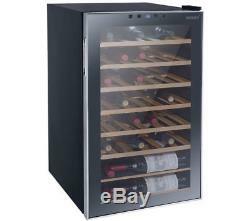 The item "Husky HUS-HN10 Reflections Under Counter 34 Wine Chiller Drinks Fridge Black" is in sale since Wednesday, December 19, 2018. This item is in the category "Home, Furniture & DIY\Appliances\Fridges & Freezers\Wine Cabinets/Fridges". The seller is "first-for-diy" and is located in cheddleton, Staffordshire.